The aim of WP1 was to establish and calibrate methodologies that allow a greater understanding of the nature and magnitude of the recoverable, sustainable and deliverable marine energy resources, including how they respond to energy extraction; the acceptable limits to exploitation and the importance of extreme conditions upon design. Numerical codes were developed, taking full account of the hydraulic and hydrodynamic natures of a tidal site, to simulate the influence of energy extraction in 1, 2 and 3 dimensions. 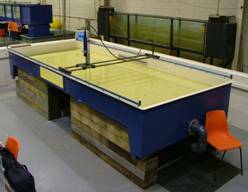 The codes and their outputs were validated using published peer-reviewed data and by testing in a purpose-built "tidal flow table". A new fundamental dimensionless parameter was identified which quantifies the sensitivity of tidal sites to energy extraction. This work also now makes it possible to identify the absolute limit to energy extraction for any well defined tidal channel, in terms of the physical parameters that define the physical environment. This enhanced understanding was applied in specific tidal case studies to consider the influence of flow modification on device design. Early principles were used by Black and Veitch in the 2004 Carbon Trust funded tidal current resource assessment of the UK and by Electric Power Research Institute in their assessment of the North American tidal current resource. Recent findings suggest that the findings of the B&V study may be conservative. 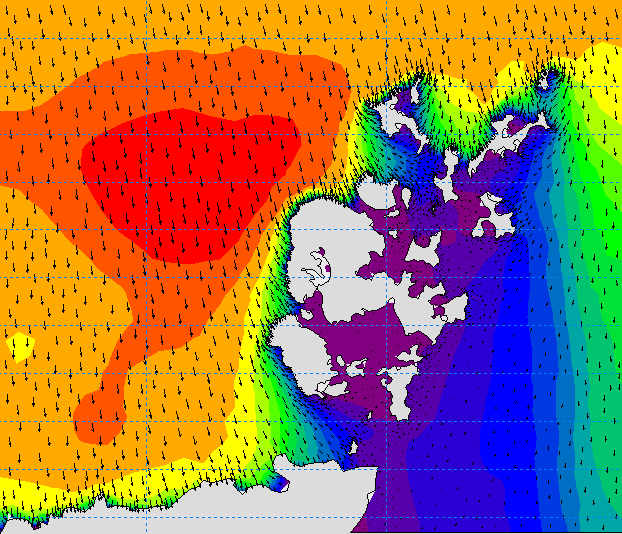 A wave prediction model was developed and applied to seas around the EMEC test site. It was calibrated against buoy data and modified to study energy extraction from an array, contributing to work in WP4 and WP3 when applied to long-term extreme wave prediction for a tidal site. Measurements at three locations in Northern Europe were analysed to show that waves behaved in groups associated with period as well as height. Two new parameters 'R' and 'S' were proposed that express the rate of change of the period from one wave to the next. This is a significant finding for the design of control systems of wave energy devices that will have to tune their response for optimum power output from series of individual waves. Real seas were shown to include many small waves with little effect on the available power. Based on these findings, the complexity of the control algorithms and systems may be reduced significantly provided that they can adapt to changing primary energy conditions. The Scottish Executive funded a parallel and complementary study to determine the extent of the spatial and temporal match between Scotland's renewable resources and demand. Wind, wave and tidal current resources were hindcast at resolutions of 1 km2. A GIS database was populated with the long-term renewable resources, geographical information, natural and cultural heritage restrictions and restrictions on land, sea and airspace use. For wind, hourly time series over three years were calculated from measurement data using industry-leading software. Wave climates, spectra and directions were calculated as time series from Met Office data. 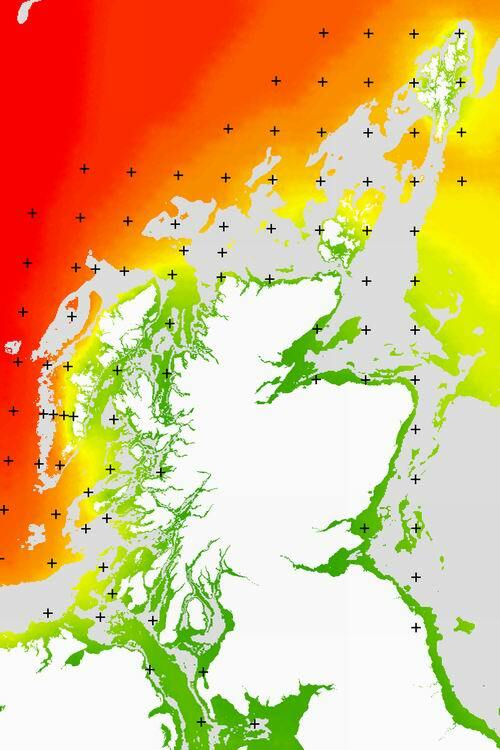 Tidal rates in potential areas were obtained from Admiralty charts, tidal stream atlases and measurements taken within the SuperGen programme. Generic models of wind, wave and tidal current converters were incorporated to quantify the resources and to produce power time series. 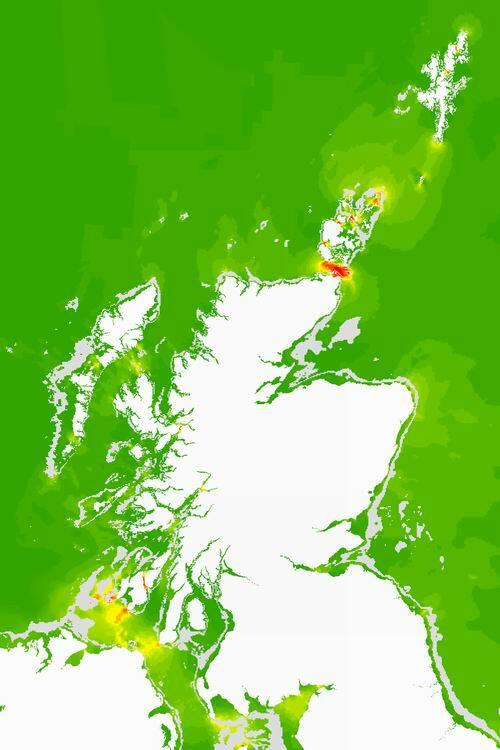 This has established techniques to derive very comprehensive geographical and temporal description of combined marine and wind renewable resources, and datasets of the Scottish potential. The physical consequences of energy extraction on marine resources are now much more quantifiable and resource assessment before and after device deployment can now be more effectively conducted, based upon firm scientific principles.